Shell Oil. Target Stores. Apple Computers. These successful companies all selected their names carefully, recognizing that a great name makes their marketing easier. You can immediately envision their strong iconic logos. The simple name works in many languages. Good marketing. Law firms don’t have that luxury. You get what you get. I was the marketing partner of Ungaretti & Harris. Rich Ungaretti is a great guy and terrific lawyer, but his surname is easy to mispronounce and misspell. Not a marketing disaster, just an added complication. Some firms though, blessed with fortuitous names, nonetheless pursue a different path. But firms that ignore the obvious not only miss a golden opportunity, they also risk looking dim, like they hadn't noticed that they're sitting on a marketing goldmine. Firms that connect their marketing to their names make their lives easier. You know that "You're in good hands with Allstate," or that "[XYZ] runs SAP." How many times have we said, "I LOVE that campaign! I wish I could remember what company it is for." Even if you remember the 1998 Gerbil Cannon Super Bowl ad, you probably can't recall what company or product it was for. It would have been more effective if it'd been for, I don't know, say, Gerbil & Co. We just don’t care enough to remember whose campaign it is. 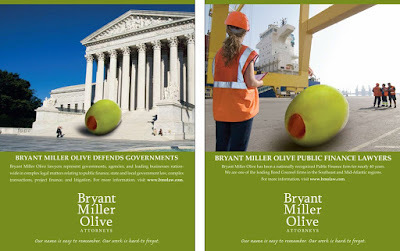 Florida-based finance firm Bryant Miller Olive had great visibility within its target audience, but needed to build visibility when it expanded geographically. 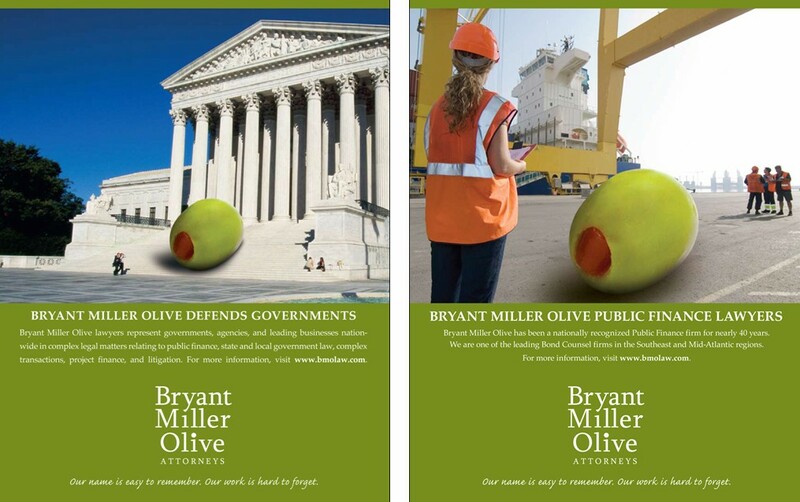 We leveraged the iconic "Olive" in a campaign that's hard to miss and easy to remember. 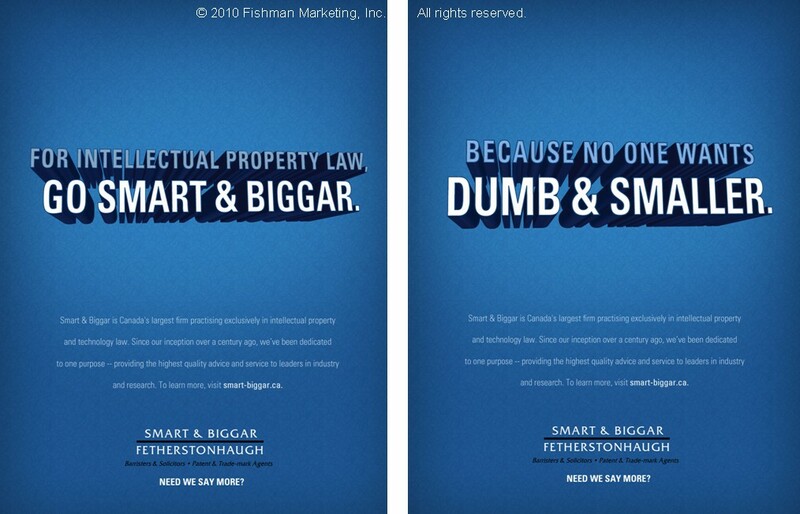 Depending on a firm's style, these types of campaigns can work all-text or supported by visuals. 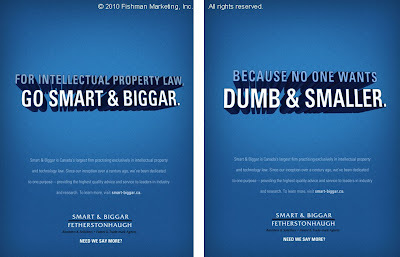 They can market a firm, or can be used to target specific industry or practice groups as well. 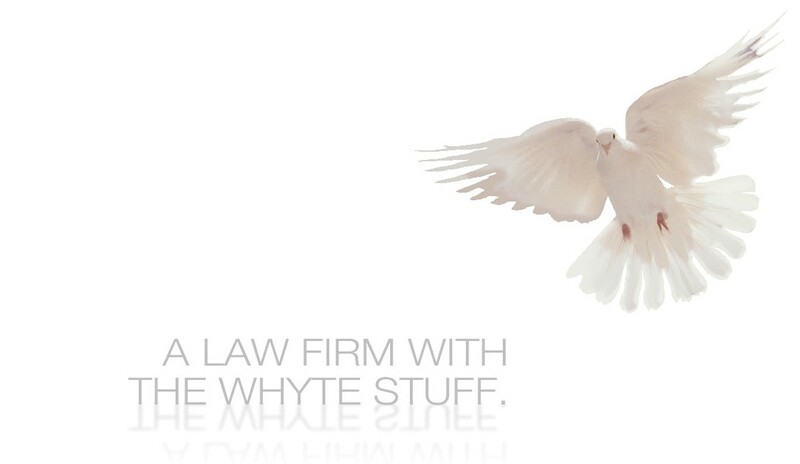 Does your firm have a positive word in it? A noun, verb, or adjective that can be used to hook your audience and connect to your larger strategy or message? 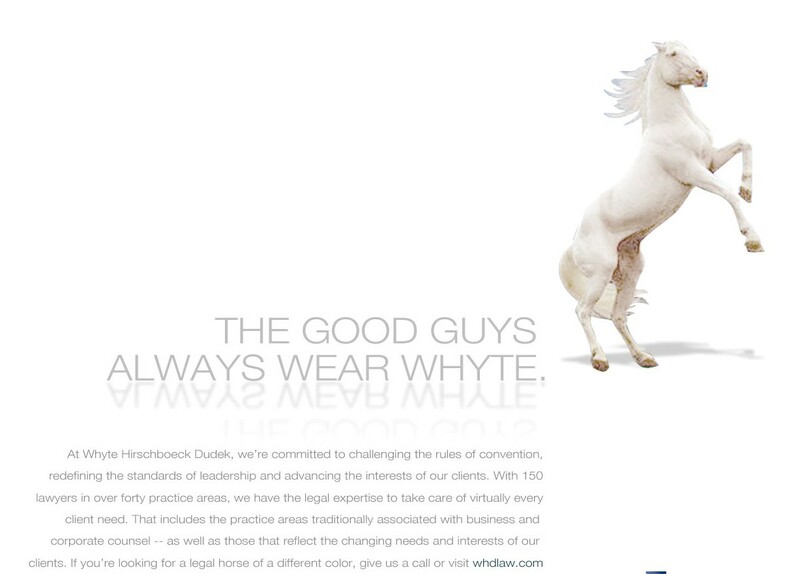 Of course, a gentle touch is necessary because it is easy to do these types of campaigns badly. There's a fine line between creativity and a groan-inducing pun or painful elbow to the ribs ("Get it? Huh? Get it? See the joke? ").